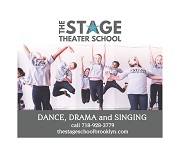 This multidisciplinary arts center offers a range of creative movement, tumbling, dance and theater classes for kids aged 12 months to 18 years. From drop-in Playspace programming Monday and Friday mornings for toddlers and parents to year-long Performance Workshops and Youth Companies for ages 9-18, students of all ages and interests have the opportunity to explore and develop their creative voices. BAX provides After School and Saturday classes, Summer and School Breaks Arts Programs, free festivals, and Arts in Education programming in partnership with public schools. BAX is a nonprofit organization committed to providing high-quality accessible arts education to all families regardless of financial means. Visit youth.bax.org for more information on programs and financial aid. 5% tuition discount (excluding summer and school breaks programs & reg. fee) cannot be combined with other discounts and scholarships. Comment: My son (turning 9) is in tumbling 3 right now at BAX and loves it! He started in tumble jumble (so probably when he was ~4?) and moved on to tumbling when he was old enough. Diane is a fantastic teacher if you can get her class.BAX's perspective about tumbling seems to be more about integrating creative movement with tumbling rather than a strictly skills based class. For the semester end concerts the younger kids usually just demo some of the skills they learned -- but as they get older though, they work as a group to design a thematic routine-- one time it was about New York City, another time it was about animals (circus ones I think.) It's a great program and he really enjoys it. Comment: We're going to try Move and Groove I at BAX on Wednesday mornings, though this week there were only 2 kids in the class so far. They are trying to get more people. Comment: My son ( 2 1/2) really enjoys the move and groove class at BAX on 5th ave and 8th street. Comment: My favorite place right now is the BAX play space. But beware that stroller parking is limited and is located on a second floor with no elevator. Subject: Re: Toddler Dance Classes? Comment: Creative Movement at Bax is fantastic! I did it with my son, now 6, and my daughter, now 3. I am a dancer myself and really believe in their program, which teaches musical and kinesthetic building blocks without any of, what is to me, weird and age-nappropriate gendered hooey. They also don’t push kids to mimic specific dance positions that are developmentally and physically not suited for toddlers. Some dance programs start with ballet positions at ages that kids’ bodies simply can’t make those shapes, and i think it forecloses a lot of creative exploration of the body and space at too young an age. Not to mention that forcing positions and “turn out” is not good for the developing bones and muscles.That is my very opinionated $.02!! I know many families have had fantastic experience in the kinds of programs I’m recommending against, and suspect they’ve all gone on to lead productive and happy lives ;) On the other hand I know a lot of retired ballerinas who’ve had hip replacements in their 40s from a lifetime of forcing turnout etc. So, my opinions are not based on nothing . . .
Subject: Re: Toddler Ballet Class? Comment: BAX has great creative dance which is developmentally appropriate for a three year old. Comment: Check out BAX (Brooklyn Arts Exchange), Spoke The Hub and Cynthia King. They're all great studios that have age-appropriate and wonderful movement/dance programs. Comment: My son, almost 4 now, attended Creative Movement I with Dawn all of last year and loved it. She was great and really engaging and the final concert at the end of the year was fantastic. BAX is a great Brooklyn institution. Comment: BAX also has a drop-in two morning a week I think. But one and only time I was there my 2 year old was bored very quickly and it doesn't really compare to what other places have to offer for the same price. Comment: AX (Brooklyn Arts Exchange) has great Creative Movement classes. Both my daughters really enjoyed them, and I liked that it was all about learning different types of moving, and making shapes with their bodies, etc. (I also really like that the end-of-term concerts don’t require purchasing an expensive outfit -- unlike my niece’s classes on Long Island).